"Christlike love is the greatest need we have on this planet in part because righteousness was always supposed to accompany it. So if love is to be our watchword, as it must be, then by the word of Him who is love personified, we must forsake transgression and any hint of advocacy for it in others. Jesus clearly understood what many in our modern culture seem to forget: that there is a crucial difference between the commandment to forgive sin (which He had an infinite capacity to do) and the warning against condoning it (which He never ever did even once). "Be strong. Live the gospel faithfully even if others around you don't live it at all. Defend your beliefs with courtesy and with compassion, but defend them. A long history of inspired voices, including those you will hear in this conference and the voice you just heard in the person of President Thomas S. Monson, point you toward the path of Christian discipleship. It is a strait path, and it is a narrow path without a great deal of latitude at some points, but it can be thrillingly and successfully traveled, 'with... steadfastness in Christ, ... a perfect brightness of hope, and a love of God and of all men' (2 Nephi 31:20). In courageously pursuing such a course, you will forge unshakable faith, you will find safety against ill winds that blow, even shafts in the whirlwind, and you will feel the rock-like strength of our Redeemer, upon whom if you build your unflagging discipleship, you cannot fall (see Helaman 5:12)." 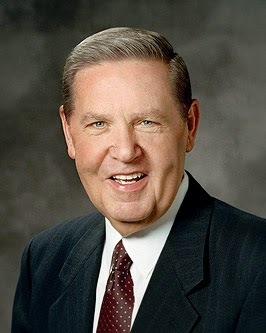 Elder Holland suggests an interesting premise: we can not truly express Christlike love unless we are living a Christlike life. Righteousness must accompany the emotion. In order to live as He lived, to love as He loves, "we must forsake transgression." Not only that, we must avoid any condoning or advocacy of sin; we must in every case stand for truth. 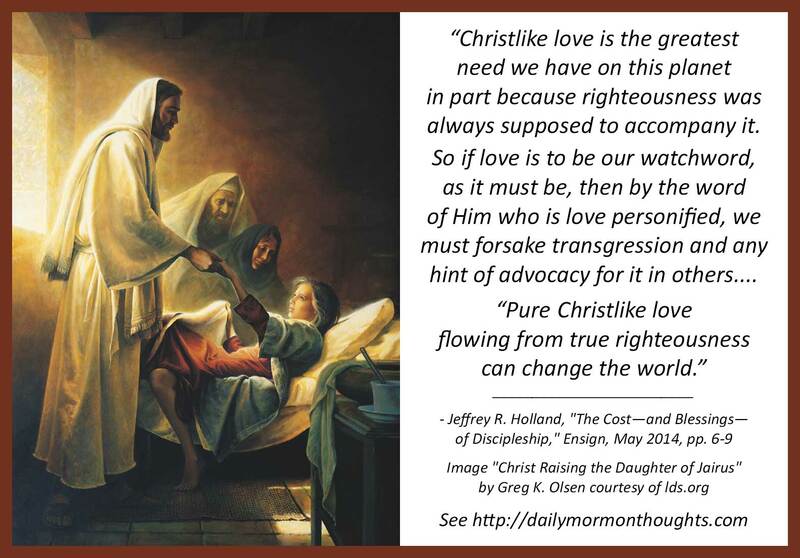 But the promise is powerful; "Pure Christlike love flowing from true righteousness can change the world."